STLCC is truly taking trash DOWN! 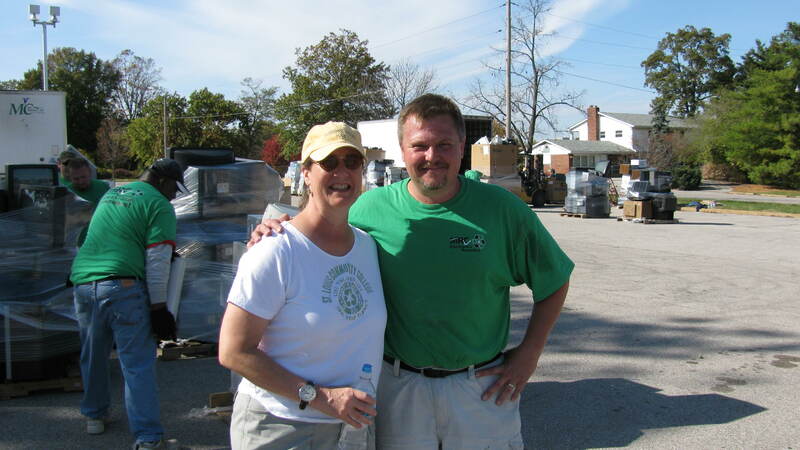 At present, we are well over 200,000 lbs collected and diverted from the landfill. I am humbled by the momentum of these electronic collection numbers. Last Saturday at the Meramec campus, over 800 cars rolled through the two well-oiled lanes of Midwest Recycling guys unloading 3 cars at a time. No one waited more than a minute or two. And even during that short time, participants were pleasantly greeted by guys who love what they are doing for a living. Several members of the public have emailed me to praise how the event was managed. 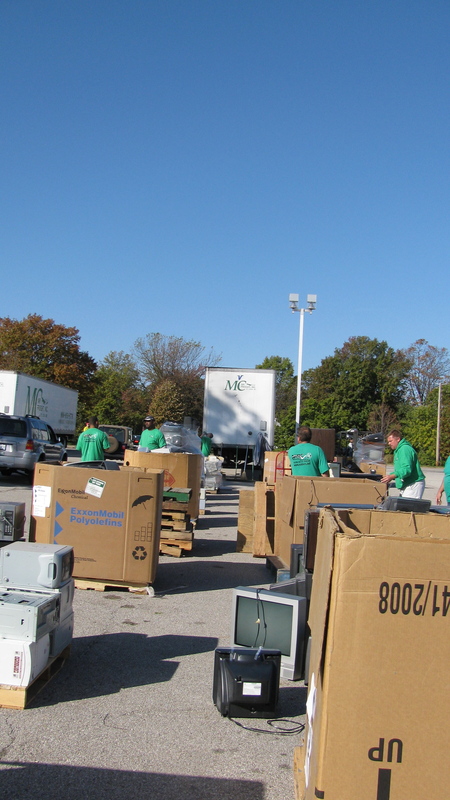 Not only were folks able to recycle electronics for FREE, they didn’t have to wait to do the right thing and responsibly divert dusty, some toxic, items from their homes and offices. There has been such a win-win on these events. More than saving folks in the community money and protecting Ma Earth, there is a true element of social justice operating. Next week will show this justice clearly at our last event at the William J. Harrison Education Center in underserved north city. Two key just developments are ongoing in the Jeffvanderlou neighborhood: a brand new LEED-Gold campus of St Louis Community College, and dozens of LEED-Platinum homes built by Habitat for Humanity and the owners. Research shows these shining examples of green architecture INSPIRE occupants to dream big. Not only do these buildings save energy–money that can be reallocated into educational goals–but residents are healthier. International studies from India show that urban poor are more than motivated to recycle given the opportunity and means to do so (Wahid Murad & Chamhuri Siwar, 2007). In fact, community co-ops find a living wage re-using and re-manufacturing waste, but need policy to protect them from commodies pimps who force labor at horrid health consequences. “It is no exaggeration to say that, throughout the world, the poorest people are forced to live in, on, and from the waste produced by the rest of us” (Leonard, 2010). Education remains a key for resource management and way to improve quality of life in underserved areas. This whole quest to collaborate with the community on these recycling events began with one elderly man trying to dispose of 3 televisions and not having the $45.00 to do so. He left dejected and unserved with his TVs. Tony Krieg (MRC Co-Owner) and I could only wonder what would happen to those units. Hopefully they ended up at Goodwill who still accepts TVs without charge. But what if they ended up by a stream all because of fees? We knew that to really succeed, we needed the help of the surrounding communities to get the word out. And that is exactly how these events have grown and succeeded. Many are faced with economic challenges, but none more so than those without employment and living below the poverty line. The grand idea was to help across the board–financially for those monetarily challenged; environmentally for those with too much STUFF; and socially for those who live with trash as a part of their landscape. Kudos to Mayor Richard Detweiller who got the word out to his staff and community; to Hands On Kirkwood, a consortium of churches volunteering their labor of love and time; to Dr. Emily Neal and her Meramec Green Team (including Toni Oplt in Community Relations); the Kirkwood Community Newspaper; and Kristen Cornett at KMOV Ch 4 TV who all got the word out to bring in a guestimated 85,000 lbs of electronic and appliances. And of course to Tony and MRC–together we all have made a true difference. Wahid, M. & Chamhuri, S. (2007, Feb.). Waste Management Resources, Vol. 25, 1: pp. 3-13.